Ekistics applies a data-driven, systematic investment methodology. Ekistics believes that real estate capital values are subject to cycles, driven by supply-demand as well as liquidity factors. Ekistics believes that such pronounced cyclicality demands a differentiated investment methodology, that focusses on and balances capital preservation and asset management/value creation potential to partially mitigate an investment’s dependence on this broader real estate market cycle. Ekistics therefore applies a systematic, data-driven, investment methodology combining the identification of fundamental macroeconomic drivers that substantiate an asset’s underlying investment thesis with the detailed analysis of investment traits. Using this top-down as well as bottom-up approach, Ekistics seeks to capitalize on long-term trends that impact human life and economic behaviour which in turn drives the physical and financial demand for real estate while at the same time ensuring that each selected asset contains key investment traits that underpin asset quality and support fundamental, asset level performance. This highly systematic, research-driven, data-rich and inductive investment methodology combines the detailed analysis of specific investment characteristics (“Investment Traits”) with the identification of fundamental long-term (macroeconomic and market segment) trends that are expected to further augment an asset’s underlying investment thesis by ensuring that it is positioned within the long-term trends that Ekistics believe drive both the physical and financial demand for real estate (“Long-Term Trends”). Amongst these Long-Term Trends are, inter alia, Continuing Urbanization, Growing Wealth, Ageing Population and Economic Stability. 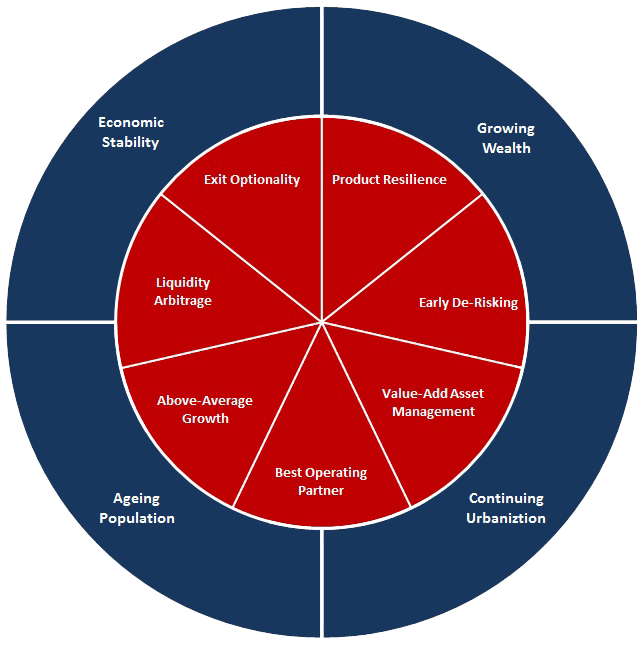 Key Investment Traits include Product Resilience, Early De-Risking, Value-Add Asset Management, Best Operating Partner, Above-Average Growth, Liquidity Arbitrage and Exit Optionality. These characteristics are primarily focused on a specific asset’s positioning within its market, financial parameters, value-add potential and exit options.